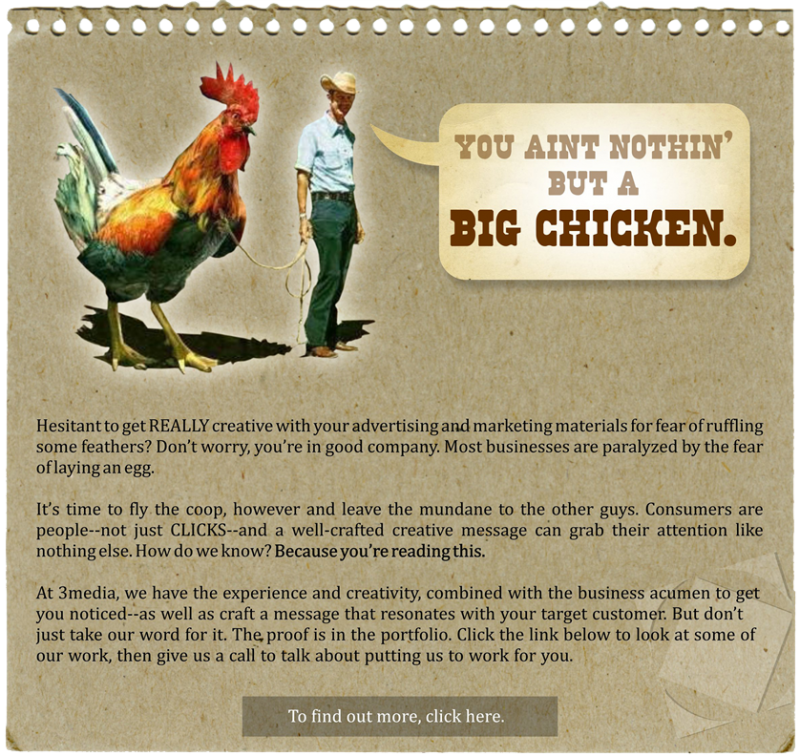 Are You Playing Chicken With Your Marketing? Some people think we’re socially challenged, ate paint chips, or that the 90’s were really hard on us. Maybe – but they left some creative residue that works to your advantage when you need to meld traditional media with new technologies for your next campaign. In fact, we’re amazingly high-functioning. So much so, that we understand business and the importance of a results-oriented effort. We’ll actually warn you when you are about to do something lame. Our services include Creative Development and Consultancy, Copywriting, Video Production, Web Hosting and Design, Music Production, Graphic Design, Product Development, & Themed Environments. At 3media, our philosophy is: “If you can think it, you can do it”. We must warn you we’re a bit unconventional, in that we do top shelf work at non-agency rates. Sure, it sounds like a marketing smoke and mirrors game, but it’s true. If you like what you’ve seen so far, give us a call to talk about your project at 800-829-4170 after 9:00am Pacific. We’re usually available to chat for a moment or two.